Home » William Caxton and the art of printing. The revolution which had been effected by war, by changes of dynasties, by the partial admission of the commons to a voice in legislation, was succeeded by a still mightier influence than any of these could exert. A power had arisen before which all others were to give place. Slowly but surely the growth of intelligence and the increase of knowledge contributed to human freedom, and to that eager desire for liberty which inevitably followed when people had learned to think for themselves and to discard the fetters imposed by those who, while they alone possessed the means of intellectual culture, strove to fetter the consciences and control the destinies of men. The invention of printing and the gradual circulation of books opened a new era to the world; and though the historical accuracy of Shakespeare may be open to question when he makes Jack Cade accuse Lord Say of having established a paper-mill in England, it is certain that printed sheets had found their way here at a very early period after the first use of wooden types began to supersede the manuscripts which were the only books known to the learned till the middle of the fifteenth century. It is remarkable that the actual invention,—or, as it may more properly be called, the adaptation,—of printing sheets from blocks of wood containing whole sentences, cannot be distinctly traced to any one individual. The first known examples of this kind of printing in Europe consisted of playing cards, and books or sheets of pictures accompanied by texts of Scripture or verses, and intended as manuals of devotion. These early “books” came, it is believed, from Holland in the first part of the 15th century, and the art of printing from movable types was certainly practiced not many years afterwards, but to whom this vast improvement is due, is by no means certain, while the successive processes of casting the types in metal and using a steel punch for forming the “face” or letter of the types in a matrix of copper, have been claimed for various persons living at the same period. The names of Lawrence Coster (Janszoon) of Haarlem, John Gutenberg of Strasburg, John Fust or Faust of Mainz, and Peter Schöffer (Apilio) of Gernsheim, are those which stand most prominently in the records of the art. 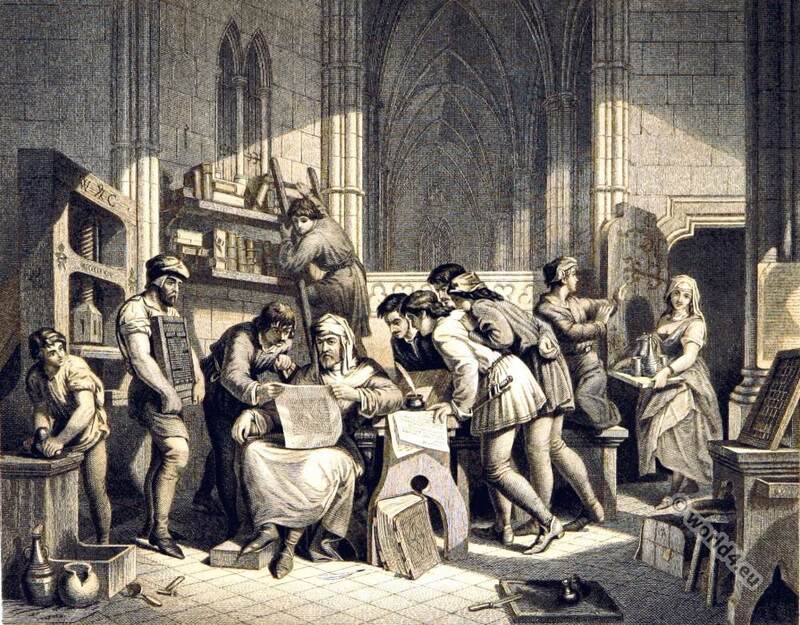 The probability is that Coster was one of the early Dutch block-printers; that Gutenberg first began to print from movable wooden types at Strassburg at some time between 1436 and 1442, and that having established himself at his native town of Mainz in 1445, he entered into partnership with Fust, who seems to have assisted him in his great improvement of casting types in metal. To Schöffer, who was in the service of Gutenberg and Fust and had married Fust’s daughter, is attributed the process of founding by the contrivance of the punch. The art was at first almost confined to the members of this workshop, but after the storming of Mainz by Adolphus of Nassau in 1462 the workmen were dispersed, and the practice of printing was carried to other countries. By the year 1530 there were, it is said, already 200 printing-presses in Europe. In 1474 William Caxton had established himself at Westminster. Even now it is difficult for us to regard the quiet patient work that was being carried on in a nook of the ancient abbey, as the greatest historical event of a period when civil war threatened to overwhelm the nation in a common ruin; and though books were soon so rapidly multiplied that they were not only widely disseminated in England but were exported to other countries, their influence was scarcely to be appreciated at a time when, in the midst of strife, very few men had leisure or opportunity to cultivate learning. The effect was none the less certain, however; and it maybe asserted that the unsettled condition of the country, and the social revolutions which followed the constant vicissitudes of rulers and people, aroused a certain independence, since the contending parties were themselves obliged to conciliate the commons by granting greater freedom, even though they may have recalled their promises when the ends which they were intended to secure had been temporarily achieved. Surely no picture in English history is more remarkable than that of William Caxton and his companions, during a period of fierce conflict and repeated insurrection, pursuing, in the seclusion of a quiet workshop, an art which had already begun to revolutionize the world. Caxton, who was a native of the Weald of Kent, was born about the year 1422, and had been brought up as a mercer in the city of London. He evidently became a person of some distinction, for he was afterwards appointed Governor of the English in Bruges, where he had taken up his residence along with a considerable number of our countrymen who had settled there as traders, and required a person in authority, not only to exercise control, but to maintain their privileges. William Caxton was a man of wealth and of considerable learning, and during this time he occupied himself in translating the Recueil of Histories, a book the copies of which (manuscript copies, of course) fetched a good price, and were in great demand. It was probably the need for multiplying the manuscripts of this book and their comparatively slow circulation which directed the earnest attention of Caxton to the professions of one Colard Mansion, who was then endeavoring to introduce into Bruges the art of multiplying books by printing from blocks and movable types, a plan by which Fust, Gutenberg, and Schoeffer had already produced an edition of the Bible which could scarcely be distinguished from the most perfect manuscript. William Caxton was ready to provide the money for a printing-office, and Mansion quickly went to work to print The Recuyell of the Histories of Troye, the first book ever printed in English. William Caxton is soon after found to have returned to his own country and commenced business as a printer and publisher, being for certain the first who practiced the typographic art in this island. He was wealthy; he had been in a high employment; it looks to us as a descent that such a man, past fifty years of age, should have gone into such a business, for certainly it was no more dignified than it is now. We can only suppose that Caxton had, all along, had strong literary tastes—had prudentially kept them in check while realizing an independence, and now felt at liberty to indulge his natural bent, while yet pleasing himself with the idea that he was usefully and not unprofitably occupied. Whatever his motives might be, there we find him practicing typography, and also selling books in a house called the Almonry (i.e. alms distributing house) near the western door of Westminster Abbey, and this from about 1476 till 1491, when he died about seventy years age. So says Mr. Blades in his Life and Typography of William Caxton, but we cannot agree with him that for Caxton so to have employed himself looks like a descent, or that there is any doubt about the real nobility of the work, which was to disseminate information and infinitely multiply the means of enlightenment. It is not indeed difficult to imagine what must have been the quiet but profound gratification of the father of English printing when he read that first proof-sheet, which displayed in very clear and beautiful typography the dedication of The Game and Playe of the Chesse to the unfortunate Duke of Clarence. For it was this work which may really be regarded as the first which was printed and published by himself. Others soon followed, such as Dictes and Sayings, 1477; Chronicles of England, 1480; Mirror of the World, 1481; Confessio Amantis (Gower’s), 1483; Æsop, 1484; King Arthur, 1485; and so on. Caxton’s house is said to have been on the north side of the Almonry, in the spot now occupied by the entrance to the Westminster Palace Hotel. It was a three-storied house with a bold gable, and a gallery running along the upper story. It fell down in November, 1845, when the other dwellings in the Almonry were pulled down to make Victoria Street, and from a beam of wood which formed a portion of it was sawn material for making a chess-board and two sets of chessmen, as a fitting memorial of Caxton’s first work printed in England. This entry was posted in 1470, 15th Century, England, Genre, Middle Ages and tagged English history, Medieval costume, Pictures and Royal Portraits on 6/5/15 by world4.